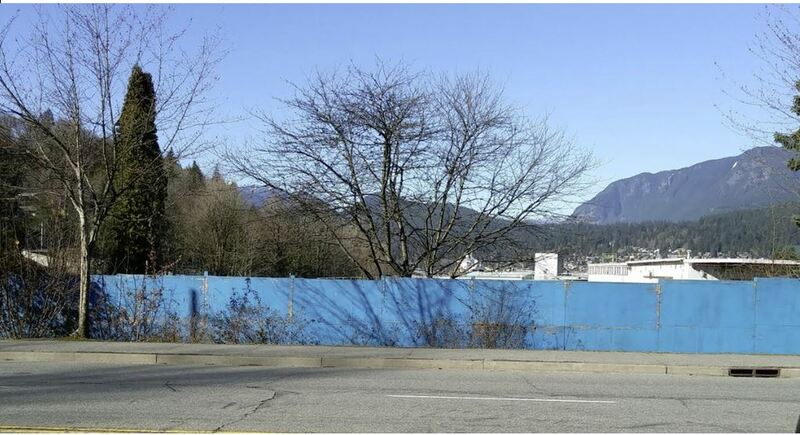 2014-10-31 — Port Moody – where should it grow? Adopt-a-street: MCCA adopted the street area of Queens Street Plaza early in 2015, and teams meet periodically to clean the area with equipment provided by the city. If you can spare an occasional hour or so to help, please email us at mcca.pm@gmail.com, and we’ll add you to our list. This would not commit you to a set schedule, but more people willing to pitch in once in awhile will help us to keep the area clean. It’s not just cleaning — it’s interaction and community building! MCCA Membership: We welcome new (and lapsed) members at any time. Must be 19+ and reside in the Moody Centre catchment area (see map). Annual fee is $5/year. Payment can be made at any event, or by contacting MCCA to arrange (mcca.pm@gmail.com). —Sunday, April 14, 2019: Earth Day in Port Moody. More information at city webpage here. —Tues., April 16, 2019, 6:00 pm at City Hall: Finance Meeting. Materials available here or here (council chambers, live-streamed). —Tues., April 16, 2019, 7:00 pm at City Hall: Council Committee of the Whole Meeting. Materials available here or here (council chambers, live-streamed). —Saturday, April 20, 2019: Port Moody’s annual City-Wide Garage Sale. More information at city webpage here. —Sunday, April 21, 2019, 10:00 am-2:00 pm: Port Moody Museum Heritage Society Easter Extravaganza. Easter egg hunt and more. More information here. —Gatensbury Road Closure, Road Improvement Project: October 2018-May 2019. Construction updates: portmoody.ca/gatensbury. —See the city calendar link from city home web-page for more events, and the Tri-City News. —Various dates and events: Port Moody Station Museum/Heritage Society. —Various dates and events: PoMo Arts Centre. Council Committee of the Whole (COTW) meeting starts at 5:00 pm, council chambers (live-streamed). Regular council meeting starts at 7:00 pm, also in council chambers (live-streamed). Complete agendas for both can be accessed from city webpages here or here. 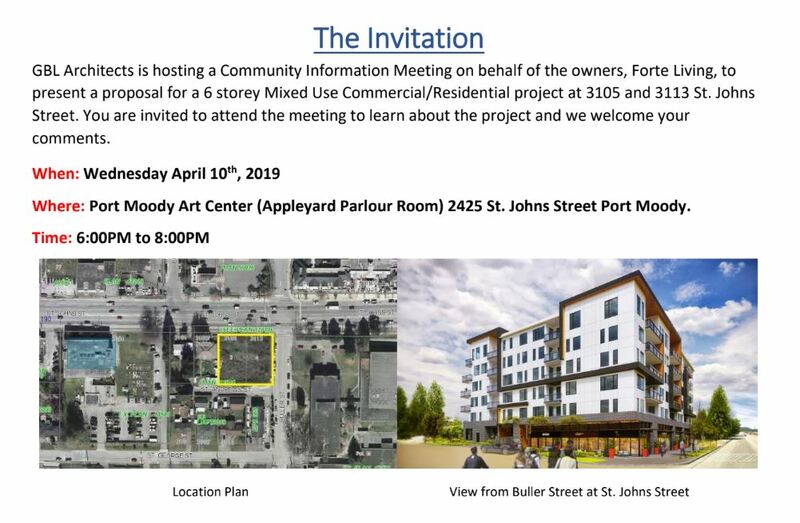 Please note public input is allowed, in-person at meetings and/or by written submission to council@portmoody.ca and/or clerks@portmoody.ca. Written submissions are not currently recorded in the official minutes. Items 9.4 and 9.5 are applications for narrow lots (RS1-S). If approved, they will move to public hearing scheduled for May 14, 2019. 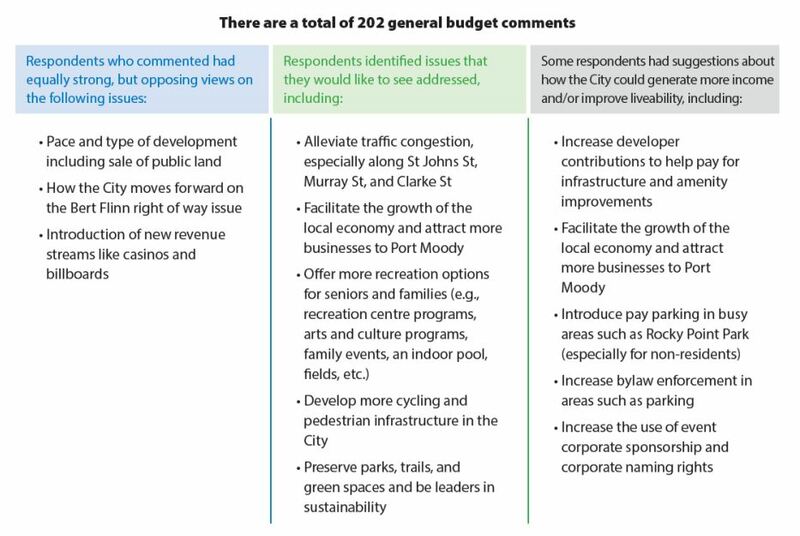 The Moody Centre Community Association welcomes your comments. 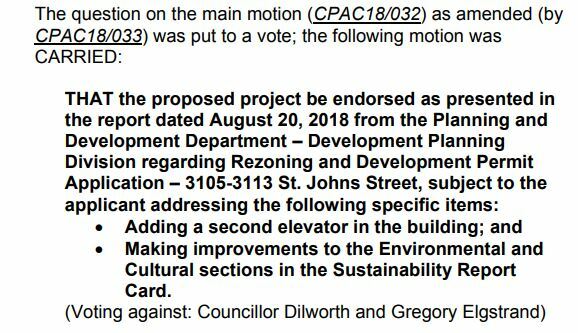 Update, April 8, 2019: The proposal was discussed by the Community Planning Advisory Committee (CPAC) on September 4, 2018. Before changes were made to procedures in 2018, the open house would have been the first public step in the process. Please see end of this post for more. “The proposed development consists of 72 units, one to three-bedroom residential units ranging from 522 – 1,179 Sq. Ft and 7,764 Sq. Ft of commercial floor space facing St. Johns Street. Seven of the residential units will be one, two and three-bedroom rental units to provide a variety of housing options in the project. The Development features an L shaped design to enhance the corner of St. Johns and Buller street and to provide an extra large south facing courtyard space for the residents of the building featuring landscaping, seating, BBQ area, exercise area, and children’s play area. Individual outdoor living space is also provided by way of private patios or balconies for all units. 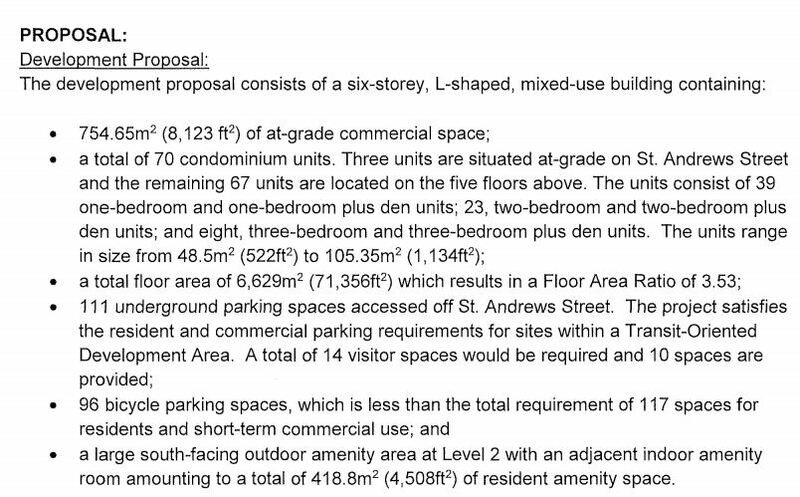 Underground parking is proposed with access from St. Andrews Street. 108 parking stalls are proposed, including 77 for residence, 17 for commercial, and 14 for visitors. 119 Bicycle spaces are also proposed. For complete flyer, click on link below. Sept. 4, 2018 CPAC meeting video here. 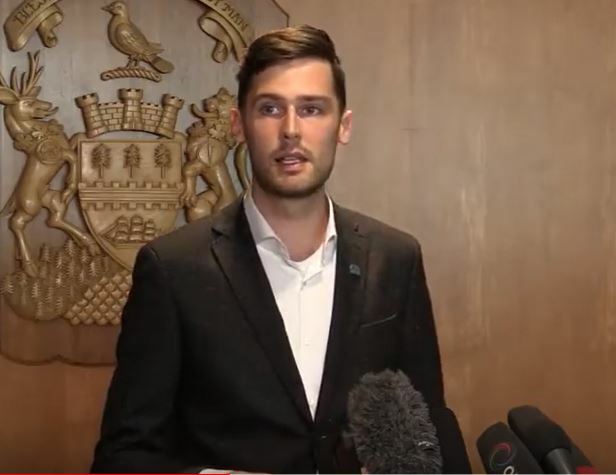 On March 28, 2019, news outlets reported a charge of sexual assault had been filed against Port Moody Mayor Rob Vagramov. The assault is alleged to have occurred on April 1, 2015. 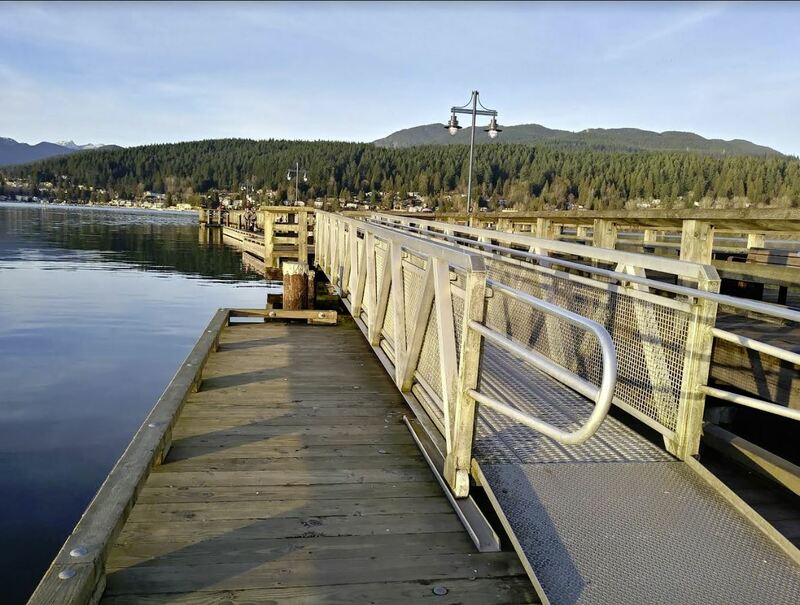 Port Moody council held an emergency meeting at 3:00 pm on March 28, and agreed the mayor would take a paid leave of absence to deal with the charge. Following the meeting, the mayor spoke briefly to the media. On April 2, 2019, council held a meeting to discuss an acting mayor rotation. The video can be accessed here. Since it’s unknown how long the city will require an acting mayor, three 3-month time slots were filled. Councillors who were available for any or all time slots had their names put into a glass for a random draw to determine the schedule. From April through June, the acting mayor will be Councillor Lahti. From July through September, the acting mayor will be Councillor Madsen. From October through December, the acting mayor will be Councillor Milani. “Port Moody Mayor Rob Vagramov is taking a paid leave of absence after being charged with sexual assault relating to an incident alleged to have taken place four years ago. More local coverage at Tri-City News. A documentary is underway about one of Port Moody’s very special residents (and Freedom of the City recipient). 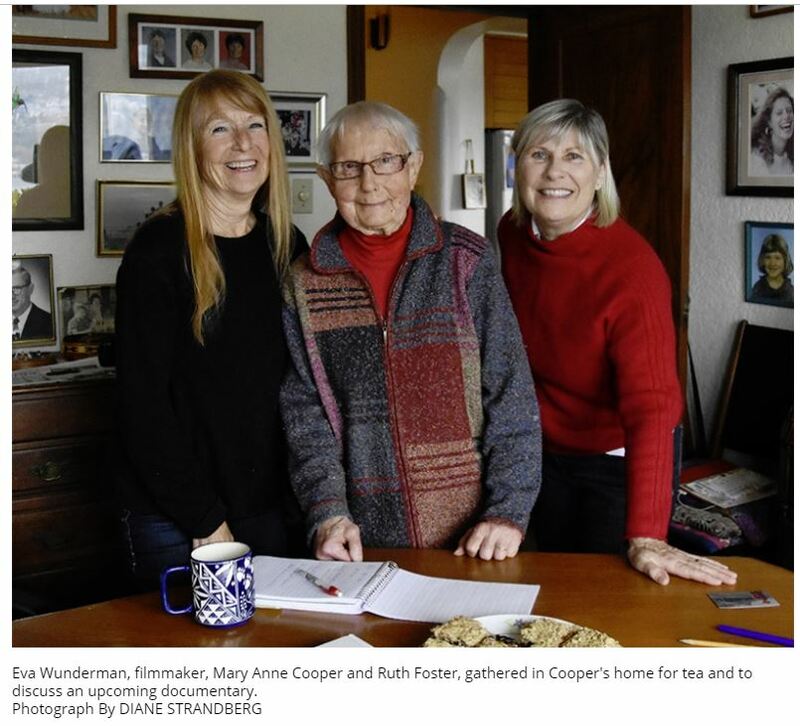 “For Cooper, working on projects is key to a long life. “To find out more about the documentary, a website has been set up and a fundraising dinner planned Saturday, April 27 at The Club, 101 Noons Creek Dr., Port Moody. (Tickets, $104 with a $60 tax receipt) can be purchased at the finance counter at Port Moody city hall). “They were pretty muddy,” but unhurt, Coulson said. 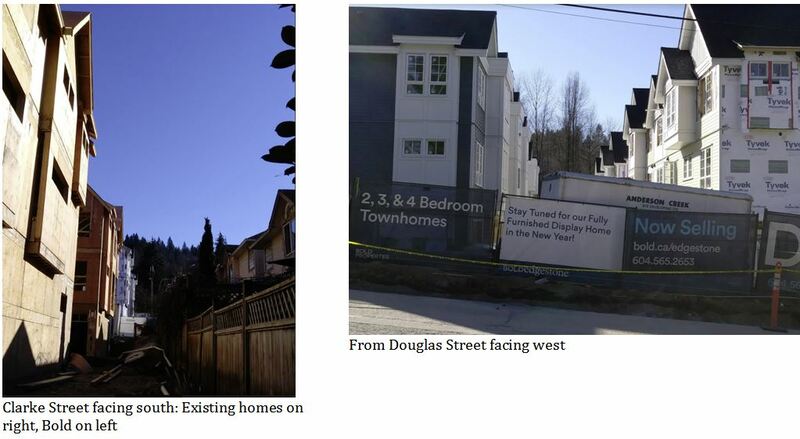 “At its meeting March 26, Port Moody council gave its assent for the city’s arts and culture committee, which Royer chairs, to spend $3,500 of its budget to make that vision happen — ideally in time for this summer, she said. Committee of the Whole (COTW) council meeting starts at 6:30 pm, council chambers (live-streamed). 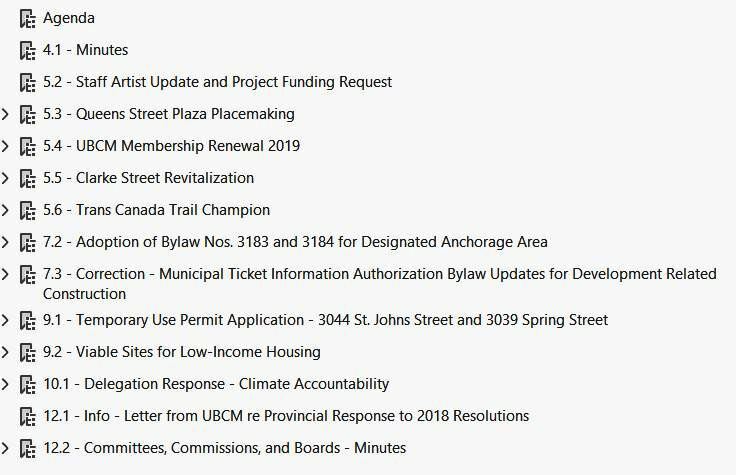 Complete agenda can be accessed from city webpages here or here. Regular council meeting starts at 7:00 pm, council chambers (live-streamed). 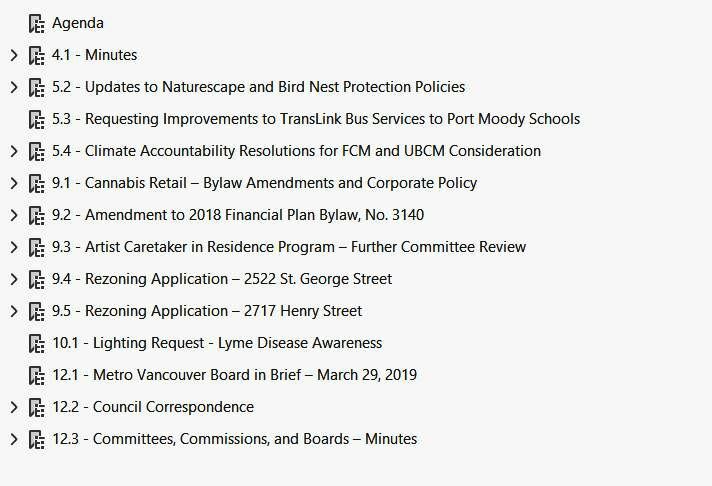 Complete agenda can be accessed from city webpages here or here. For more, click on links provided above. North side of Clarke Street, same area as Bold. Colourful fence wrap is gone. City list of development applications and updates here. Finance Committee meeting starts at 6:00 pm, council chambers (live-streamed). Complete agenda can be accessed from city webpages here or here. Committee of the Whole (COTW) council meeting starts at 8:00 pm, also in council chambers (live-streamed). Complete agenda can be accessed from city webpages here or here. Proposed tax summary, based on “average” dwelling unit valued at $1,006,000 (a higher-valued household will have a higher increase). 2019 proposed tax increase of 5.55% = $124 to the average household. This is approximately $10.33/month or $2.38/week. 2019 utility increase of 4.18% = $50 to the average single-family household. This is approximately $4.17/month or $0.96/week. 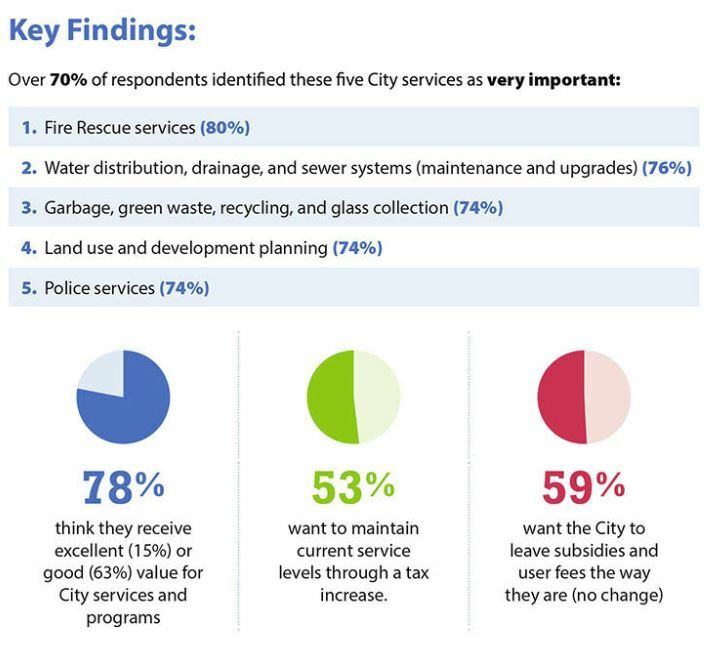 City staff will present a report, Public Consultation Results for the 2019 Financial Plan (Item 4.4), at a March 19 Finance Committee Meeting. The meeting starts at 6pm in Council Chambers, 100 Newport Drive or you can watch the Finance Committee meeting live. BC Municipalities Property Tax Calculator, by Savii Financial Concepts. Note: numbers are for last year, January 2018, and not updated for 2019.